SOMEFLU is a pump manufacturer specialized in the engineering and manufacturing of corrosion resistant centrifugal pumps. SOMEFLU pumps are made of thermoplastic and designed in horizontal or vertical version. We do in our own facilities the machining of all plastic parts and the plastic processing under our own home made process. SOMEFLU pumps are designed for the most difficult industries where corrosion and abrasion resistance are complexes to solve. 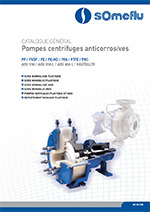 These pumps are made of engineered plastics such PP, PE, SOMEDUR®, UHMW-PE, PVDF, PFA, PEEK… and designed to handle both corrosive or abrasive fluids which could be clear, slightly or heavily particle-loaded fluids. Our standard range have flow rate capacities from 1 to 2000 m³/h for heads up to 130M. With its experiences, SOMEFLU is also able to design on demand much higher corrosive capacity pumps. SOMEFLU pumps are manufactured and engineered as per your specific requirements, constraints (space, concentration, temperature, viscosity, solids, fluids…) and installation to fit to your specifications. Our experience in the use of engineering plastic guarantees towards providing the best suited solution to customers’ requirements. The manufacturing unit is equipped with most advanced CNC machines, generation software (CAD/CAM) and digitally controlled machines making it possible to meet cost, quality and deadline requirements. SOMEFLU offers its clients the most effective and economic solutions. Our sales engineers have close relationship with the clients and share their experience and knowledge. We use the most modern design and application tools towards meeting your exacting requirements and optimize both the CAPEX and OPEX of our products. The high performance plastics PEEK, PFA, PVDF, PEI, PSU… are processed in our APLAST® moulding unit located in the Savoie region of France under a plastic process developed by APLAST® for many years. APLAST® is also supplying high tech industries with the same process.